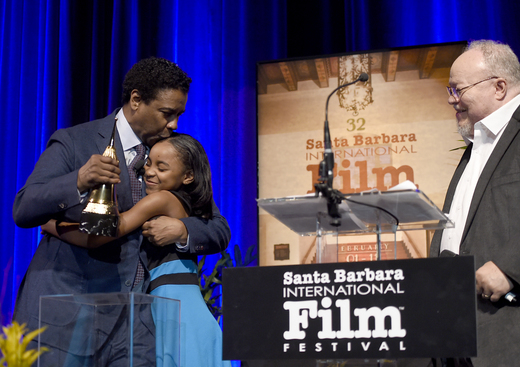 The 32nd Santa Barbara International Film Festival is in full swing as Leonard Maltin awarded the Maltin Modern Master Award presented by Dom Perignon to Denzel Washington last night. A man of the people, Washington greeted hundreds of screaming fans lining the street at the historic Arlington Theatre. Stopping for conversations and photos along the way, he made many dreams come true. SBIFF Executive Director Roger Durling began the evening with a short introduction to esteemed film critic Leonard Maltin, whom then brought Washington on stage to a thrilling standing ovation. Humbled and excited, Washington paused for a moment to take it all in. During the 90 minute candid conversation about Washington’s career, when asked where is his Oscars live, the self-acclaimed “theater snob” joked that, “they live next to each other with their three buddies from the Golden Globes.” Washington continued, “but they miss their Tony in New York City.” The audience was in a fit of laughter.